We've been doing a little planting in these parts. Logan got to plant a tree with daddy, right outside his window. He has now become obsessed with our yard, just like daddy. Now I get to hear the question, "You like my yard?" about 38 times a day.... then my man comes home and asks me an additional 8 times, "You like my yard?" Needless to say, this love of the lawn called for some great gardening picks. So off to the library we went and we scored some great books! Muncha Muncha Muncha by Candace Fleming was my favorite find. This is finally the year that Mr. McGreely decides to plant a garden. He dreams of getting his hands dirty and of growing yummy vegetables and gobbling them up. Unfortunately, three bunnies dream of gobbling up those same vegetables. Mr. Greely is angry. He builds a small wire fence. It doesn't keep the bunnies out. Mr. McGreely begins to build more elaborate fences, walls, and trenches. He ends up with a great big enormous thing- a brick wall with search lights barbed wire! Will Mr. McGreely win the battle of the bunnies? Find out in this hilarious tale. Think this is just a work of fiction? Think again. Our real-life Mr. McGreely, my dad, the super gardener built an 8 foot fence to keep out deer, bunnies, raccoons, grandsons? 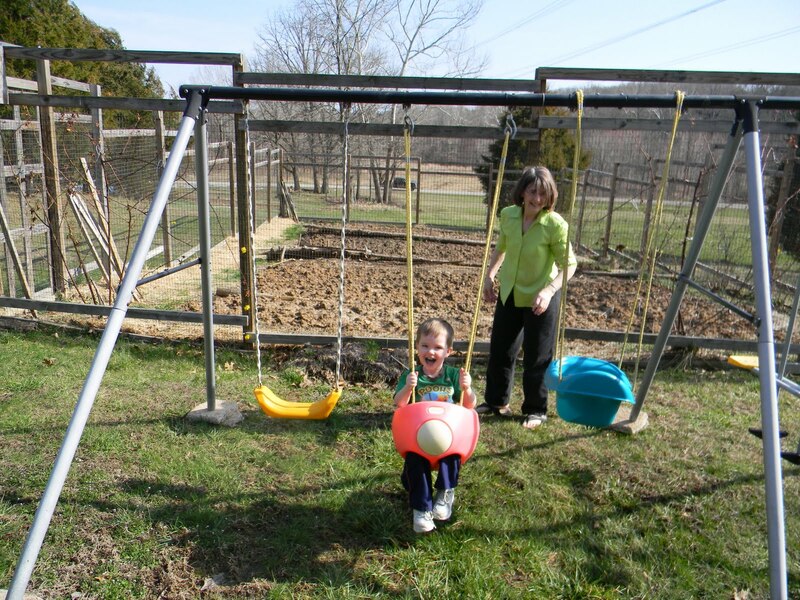 Wait, grandsons are always welcome in the garden. We won't make fun of his gardening obsession too much since he hand delivers fresh fruits and veggies all summer long! 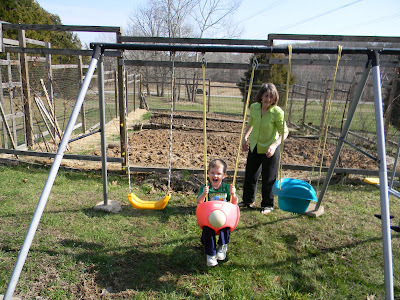 Logan and Grandma playing next to Grandpa's garden fence in March. While we chomp down on Grandpa's spinach, strawberries, green onions, and lettuce, please check out our other gardening picks. Also, check out my reviews of Planting a Rainbow and Growing Vegetable Soup by Lois Ehlert. heehee, I'm chuckling at your dad's fence too! Not that I can really make any statement on the matter since I've never successfully even kept a houseplant alive. My son loved growing vegetables when he was little... he had his own little patch with snow peas, beans and zucchini. It created a great love of cooking a little later in life- I can still remember my proud 8-year-old presenting us with a delicious stuffed zucchini, recipe 'invented' by him- it was delicious! I wish all little boys had the opportunity to learn the joys of home gardening like this. What fun selections! We're reading Lois Ehlert's Planting a Rainbow this week. I'm going to go write these down now... Thanks for sharing! I think every boy loves to "garden" - i.e. get muddy! Thanks for the book suggestion! Your husband sounds just like my husband, and the book you reviewed looks really good. Thanks for joining WMCIR! I feel like I'm living this book! The deer are eating EVERYTHING in our yard. I think I NEED one of those fences!